As we age, our skin loses collagen and elasticity. As a result, unattractive wrinkle lines can mar the forehead area. Frown lines appearing between the brows and across the upper brow area can make you appear angry, worried, or too severe or downbeat. Sagging forehead skin can make your eyebrows droop, resulting in hooded upper eyelids. Drooping eyelids can add more years to your appearance, making you look tired and block your vision. If these signs of aging in the brow and forehead are bothersome because they make you look older than you really are, a lift procedure in these areas could be the solution you need. What’s the better procedure for you: an eyebrow lift or a forehead lift? While some may differentiate between a brow lift and a forehead lift, in fact, a brow lift and a forehead lift are two names for the same type of plastic surgery procedure. What can an eyebrow/forehead lift do for you? A brow lift/forehead lift is facial plastic surgery that corrects the brow line as well as smoothing out forehead features, creating a more youthful-looking appearance. A brow/forehead lift can vary in intensity, from the less invasive endoscopic brow lift to a coronal full forehead lift. Which lift is best for you will depend on your individual needs and facial anatomy. 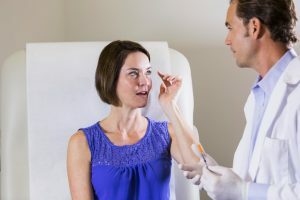 Where can you find the best eyebrow lift/forehead lift surgeon in Houston, Texas? Cecil Yeung, MD, FACS, is a well-known plastic surgeon who performs brow lift and forehead lift procedures in Houston, TX. He is recognized for his minimally-invasive brow/forehead lift surgical techniques that deliver the most natural-looking and long-lasting results with shorter recovery times. Dr. Yeung is double board-certified in facial plastic surgery as well as otolaryngology, also known as the ear, nose, and throat (ENT) specialty. Dr. Yeung may also recommend eyelid surgery (blepharoplasty) to be performed with a brow lift to give you the best, most natural-looking and complete results. Typically, eyebrow or forehead lift surgical procedures are performed at the Yeung Institute for Facial Plastic and Sinus Surgery in Houston, a state-of-the-art, fully accredited surgery center, which is on the premises at Dr. Yeung’s Houston location. There, you receive exceptional, attentive, and high-quality care in a luxurious, private, and comfortable setting. If you’d like more information on rejuvenating your brow line and forehead by smoothing deep lines and folds in your upper facial area, contact our office today to learn more about an eyebrow lift/forehead lift procedure. Our courteous and friendly staff will quickly respond and answer any questions you may have. You can also begin the process by filling out the appointment request form right on this page.